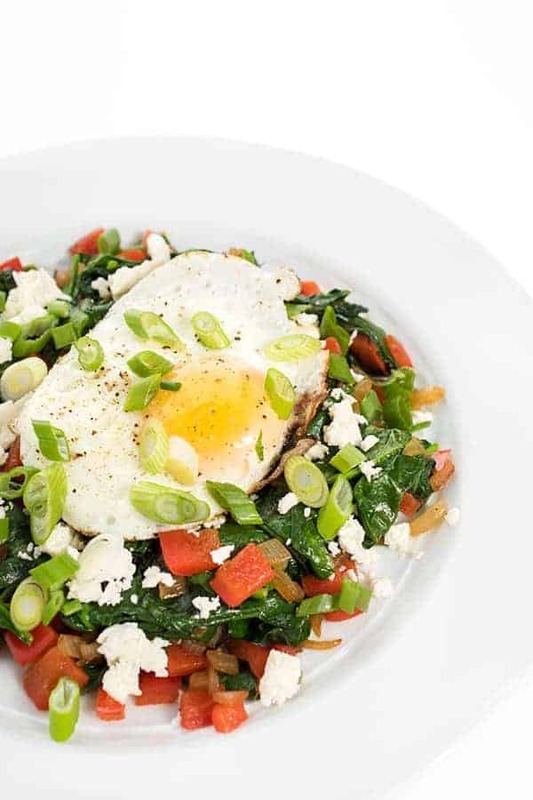 Veggies are sautéed in olive oil and seasoned with Greek spices before being topped with creamy feta and a fried egg. 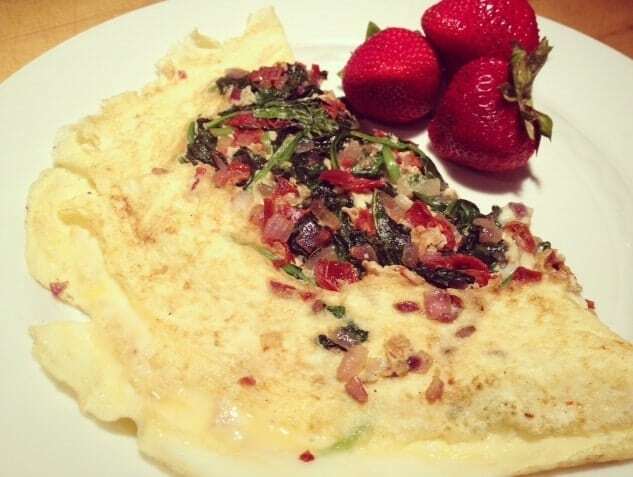 The ultimate high protein, low carb breakfast! Do you ever find yourself stuck in a healthy breakfast rut or find yourself eating the same thing again and again because it’s easy? Trust me, I’m right there with you. Most mornings I’m busy trying to decipher which fruit my 4 year likes that day and which color bowl is his favorite so I know all about hectic, busy morning routines. 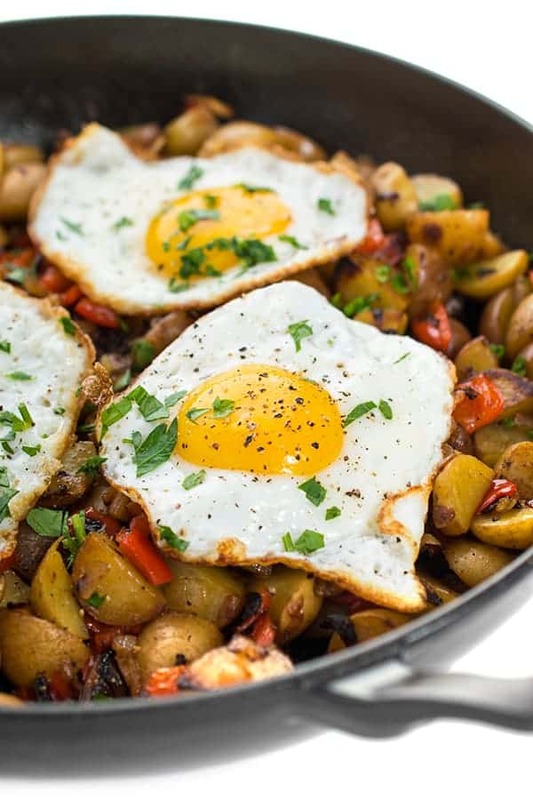 One weekend I recently decided to skip my usual morning smoothie and experimented with a savory breakfast which resulted in this Greek Egg Skillet with Sautéed Veggies and Feta. My goal was simple: come up with a recipe that took the same amount of time as prepping a smoothie but was savory, high protein and low carb. I’m thrilled to share that mission: accomplished. 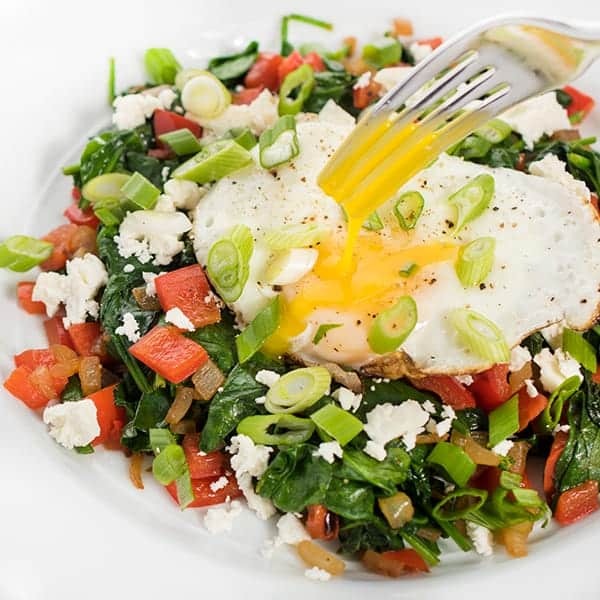 Spinach, peppers and onions are sautéed in olive oil and Greek spices then topped with a runny egg and creamy feta. It couldn’t be easier to make and it kept me full and satisfied until lunch. 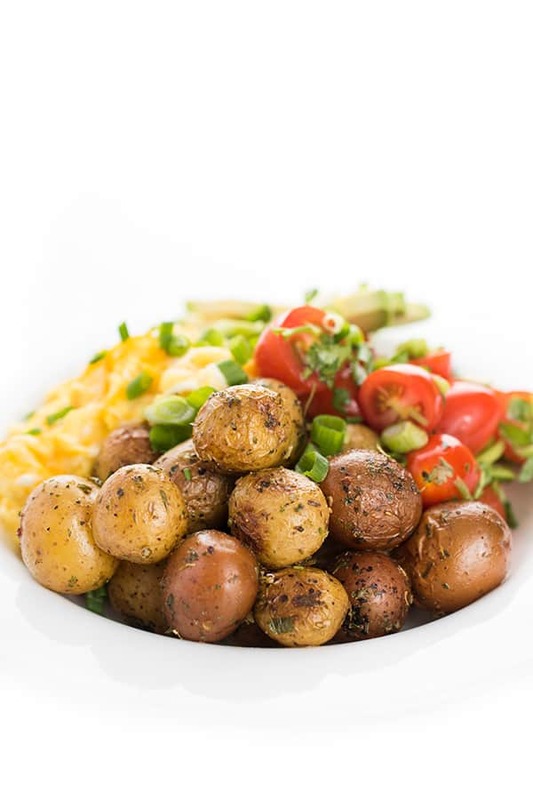 Feel free to get creative and use any veggies you have on hand or top it with scrambled, poached or hard boiled eggs. The options are endless. 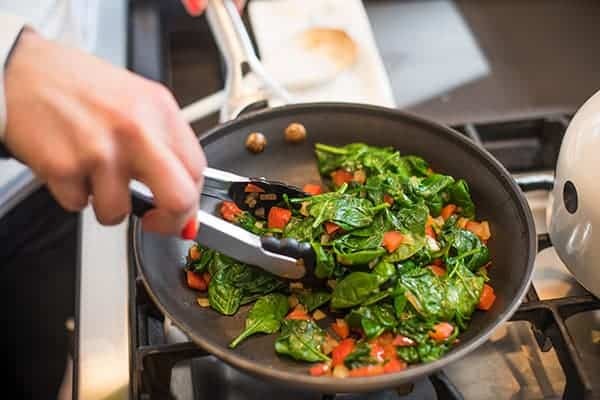 Stir in spinach and cook until wilted, about 1-2 minutes. 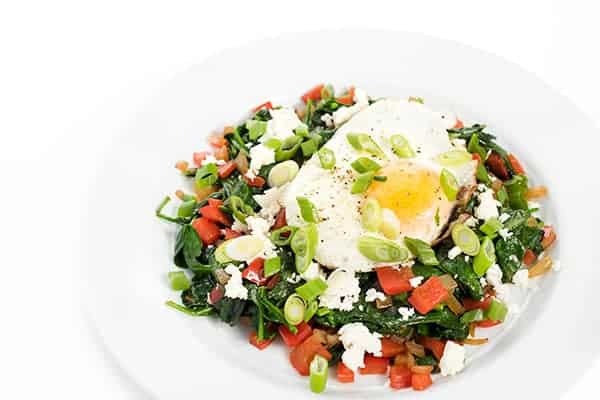 Divide sautéed veggies between four plates and top each plate with an egg cooked to order. 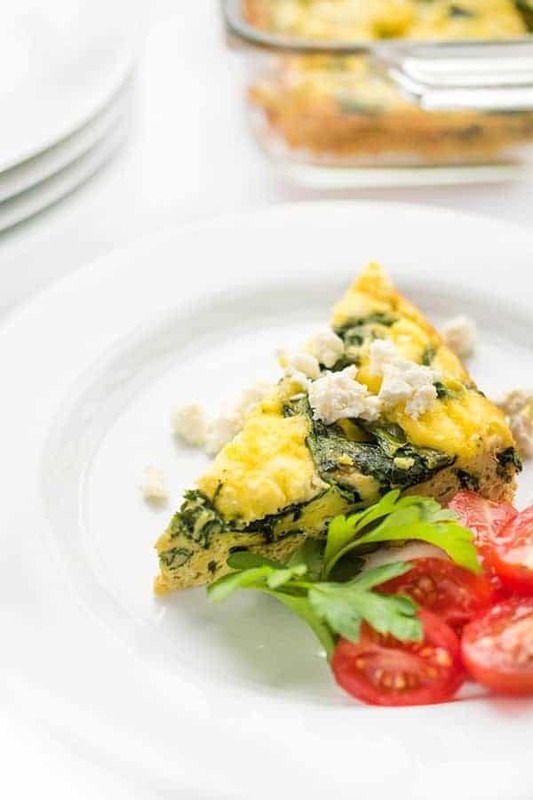 Sprinkle each plate with a tablespoon of feta before serving. For added protein, top with two eggs instead of one. 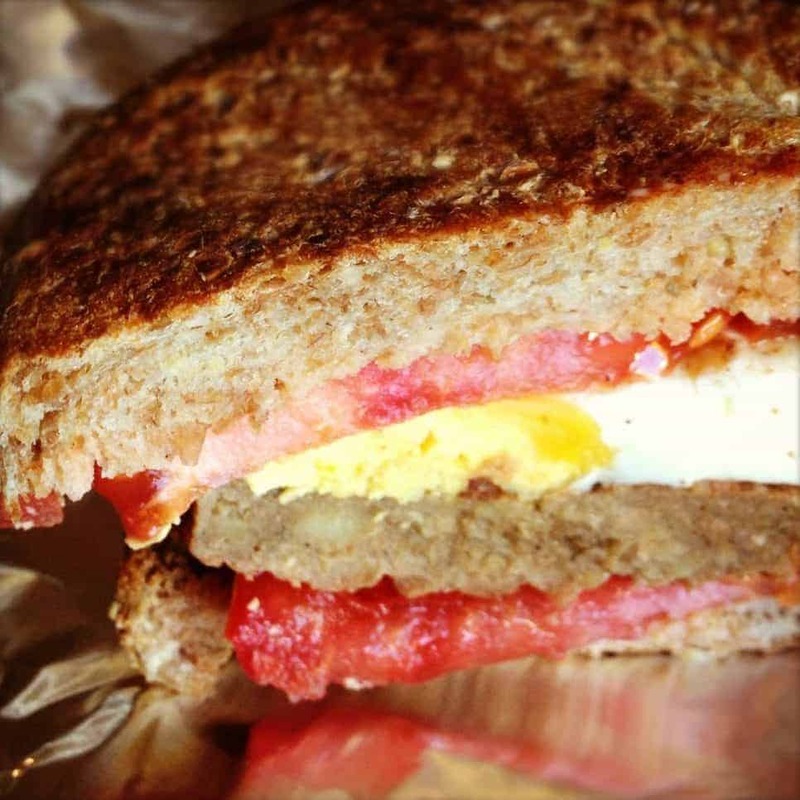 Check out my Pinterest board to see more healthy breakfast recipes! Yes to a bunch of veggies at breakfast! This is my kind of breakfast! !